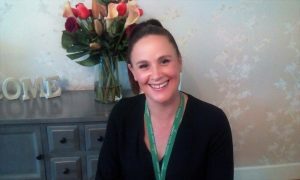 Lucy has been working in care for nearly 10 years and the last 9 years of that she has been a Senior Carer. She has a National Vocational Qualification in Care at Level 2 and 3 and Level 5 in Leadership and Management. Lucy has worked for Cedars Care Group since joining in March 2014 and has been the Manager since March 2015. Lucy is very passionate about dementia care. ‘We try varied techniques to engage and stimulate our residents,’ says Lucy, who actively engages all the staff at Cedarwood House, in promoting good practice within the home. Her mission: to significantly improve the quality of life of our dementia residents. Alicia has been working in care for over 7 years and the last 6 years of that she has been a Senior Carer. She has a National Vocational Qualification in Care at Level 3 and is working towards her Level 3 in Leadership and Management. Alicia is also a champion of Dignity in Care, Oral Health and Infection Control. Alicia has worked for Cedars Care Group since joining in June 2015 and has been the Care Manager since May 2017.